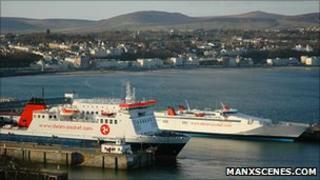 The chief minister of the Isle of Man has expressed his concern for the future of Manx ferry passenger prices. Tony Brown was responding to questions from MHK David Cannan in the last sitting of Tynwald for 2010. Mr Cannan referred to a recent statement from the chairman of the Steam Packet which indicated ferry passenger fares may increase. Tony Brown said: "While the commercial battle is unfortunate, this is how the free market works". The Steam Packet Company has indicated it may have to increase passenger fares after losing about 15% of its freight business to a rival service. The Ramsey-based Mezeron's daily freight service between Douglas and Liverpool is a direct competitor for the Steam Packet, which operates services from Liverpool, Heysham and Birkenhead to Douglas. The chief minister confirmed he was currently waiting for the publication of an Office of Fair Trading report which he anticipated would "clarify the position in relation to ferry costs".